Basically, there are only two designs of human being; male and female. And yet, getting a good eye full of either still seems to be one of the most shocking things that contemporary society has to offer. So when six unemployed Sheffield blokes decide to bear it all in a Chippendale-inspired, women-only strip show, they swiftly make the headlines of the local rag. Their all male revue is mounted in a desperate attempt to get themselves off the dole queue, where they’ve been since the steel mill where they worked shut down, and into the headspace of being vaguely valuable. Gaz (Robert Carlyle) needs to get his hands on some cash to support his son and maintain access to him. His chubby buddy David (Mark Addy) has been suffering from self esteem issues since his wife started bringing home the bacon instead of him. But it’s their former foreman Gerald (Tom Wilkinson) who is dealing with the biggest shame job, secretly keeping up appearances by pretending to go to work each morning and accompanying his wife to ballroom dancing classes at night. When Gaz and Dave discover his ruse they rope him in as their choreographer and soon they’re rehearsing alongside the previously suicidal Lomper (Steve Huison), the elderly yet eminently funky ‘Horse’ (Paul Barber), and the well-hung Guy (Hugo Speer), surmounting a string of obstacles along the way. Director Peter Cattaneo (who recently helmed the outback flick Opal Dream), and producer Umberto Pasolini were mindful not to present a scenario whereby unemployment was promoted as being alright as long as you got your gear off, so they loaded the story with plenty of pathos and the result is a little gem that moves you both to tears and laughter. 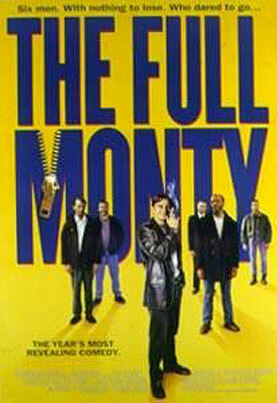 A triumph at the box office, The Full Monty was Oscar nominated for Best Picture, Best Director and Best Screenplay (by Simon Beaufoy), taking home one for Best Music. Buoyed along by a fool-proof soundtrack that features classic tunes by Hot Chocolate, Gary Glitter and Tom Jones, the former steel workers rise up from their status as scrap metal to be heroes. And even if it is only for one night, their journey celebrates the human spirit…..and the human body too, in all its naked glory.